Toddler Approved! : BabbaBox: A cool learning tool for kids! BabbaBox: A cool learning tool for kids! One of the main goals of this blog is to help parents connect with their kids in fun and creative ways. We also love finding cool ways to embed learning into our day. Last week EJ shared a seriously awesome swimming pool scrabble game that I think was a genius idea! I also discovered tons of creative learning activities in last week's Kid's Co-op link up. Today I am excited to share another cool learning tool with you! If you are a busy parent... or maybe one who needs some extra time connecting and creating with your kids this summer, you are going to love this! My son was SO EXCITED when our BabbaBox arrived about a week ago. Can you see the intense concentration in the picture above? He couldn't wait to rip open the box! So, what is a BabbaBox? The BabbaBox is a subscription box that is delivered to your home monthly and is filled with educational and fun activities for you to use as you connect, create, explore, and learn with your kids! Each box contains the four components listed above and is carefully designed by a group of experts to engage and excite kids ages 3-6... though many of the activities can be adapted for younger or older kids. 1. Everything we needed was inside the box. Everything we needed for each craft or activity was included in the BabbaBox. I didn't have to hunt for a specific type of glue or wait in line at Michaels for special paper... it was all in the box. Loved it! 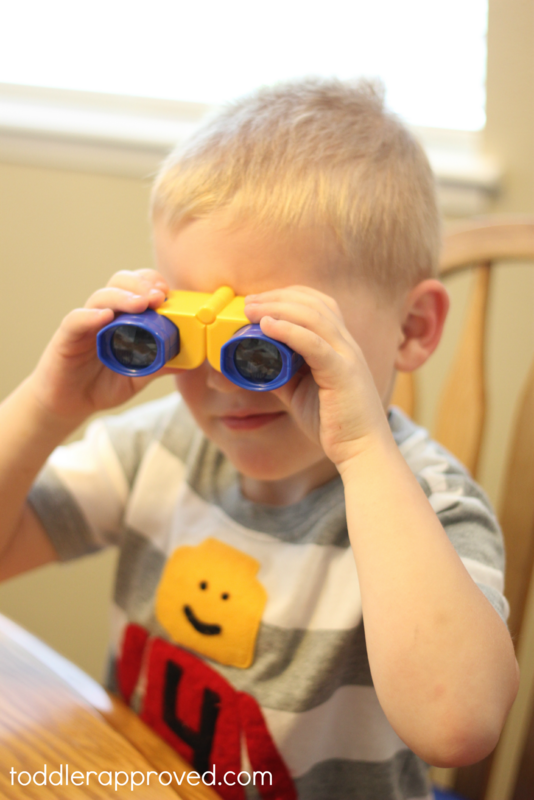 The binoculars that came in our Sun, Moon, and Stars kit were a hit! My son also loved the constellation sticker activity. The activities provide hours of entertainment over the course of several days. 2. The instructions were simple and easy to follow. I purposely had my husband (the non-crafty one) spend a lot of time exploring this box with my son. While I went out for the night I had the boys create the paper mache moon night light pictured above. They had a blast. Each craft or activity in the box comes with a little instruction booklet. It shows the materials that are needed, the steps to do the activity, AND (my favorite part) little facts and tidbits of information to go along with the activity! I also love how the activities each have a little parent icon next to them to let you know what skills are being embedded into the activities- motor skills, cognitive skills, etc. Our box was Sun, Moon, and Stars themed... which was the PERFECT box to arrive the day after we had a solar eclipse! My son was already excited about the topic and the little informational tidbits that we shared as we did each project made him even more fascinated with the theme. 3. We got a new children's book! We are bookaholics, so getting a new children's book was a big deal! My 4-yr-old son and 18-month-old daughter both beelined for the couch as soon as they saw the new book. They were totally engaged in checking out the pictures and listening to the new story. Our box included the book Twinkle, Star of the Week by Joan Holub and also included directions for connecting to exclusive online content where my son could learn how to play "Twinkle Twinkle Little Star" on a digital piano. Although the book was definitely more appropriate for my son, my daughter still enjoyed it. When I read it with her we modified the text to make it simpler for her to understand and we talked about the pictures a lot. It was a great activity to help her develop some new vocabulary words! 4. We were inspired to investigate, explore, and create! The cool binoculars we got in the kit tagged along on our camping trip to Big Sur this weekend. My husband and son headed out at nighttime to observe the moon and check out the stars that they'd learned about as we did the constellation sticker activity. As we read the children's book in the kit we were also inspired to create a few other related activities and projects that we'll be sharing on the blog later this week. One of my favorite things about this box is that it cultivates an environment for creating, exploring, and learning in your home... which then motivated us to keep learning and discovering new things even after we were done with all of the activities in the box. 5. It gave us time to connect with one another. Not only did our BabbaBox give us a reason to connect with one another, it also gave us extra time to connect because I didn't have to use extra brain power to create or research new activities or ideas... they just arrived on our doorstep! Last week was filled with deadlines and obligations that didn't involve me spending time with my kids... so the arrival of this box seriously saved the day. I am a creative person and I love coming up with my own projects and learning activities for my kids, but it was so lovely to have it all easily put together for me so that I could just be present and enjoy my kids during the few moments of down time that we did have to spend together. Do you want to spend more time with your kids this summer... and less time coming up with fun and educational activities to do with them? Go to "Join Now" at www.babbaco.com and sign up for the Summer Survival Pack before June 1st and receive 33% off! Use coupon code TASummer33 at checkout. That's only $20 per box for the summer! Or you can sign up for the monthly membership and receive 20% off your first box. Use coupon code TA20OFF at checkout. To learn more about BabbaCo and BabbaBox subscriptions you can check out their website here. BabbaCo also has an awesome Facebook page where you can find loads of great ideas for more summer fun. I think giving BabbaBox subscriptions might be my new "go-to" gift for nieces and nephews. What an ingenius idea! 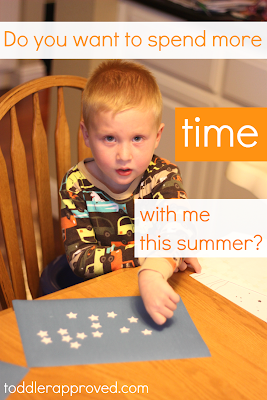 How else do you connect and create in simple ways with your kids during the school year and summer? Do you create a summer bucket list or have a tool you use to plan out your summer activities? What topics would your kids like to spend more time exploring once school lets out? Do they have any current favorites? Disclosure: The products reviewed in this post were given to me for free by BabbaCo.com. All posts reflect my personal opinion and endorsement and are not swayed by compensation and/or free products. Please note that this post reflects my opinion and you might not share that same opinion.